Bushmills is a small inland village on the Causeway Coast. It is the closest settlement to the world famous Giants Causeway only 2 miles to the North. Surrounded by endless shades of green fields, it is home to less than 1500 people and is 7m North East of Coleraine and 12m West of Ballycastle. Bushmills was named, in the 17th Century, after the River Bush, a reveered River that starts in the Antrim Hills and flows into the Atlantic Ocean at Portballintrae and a mill that was powered by the river. The Town Centre is quaint and feels like you have stepped back in time with the old fashioned shop frontages and the Distillery. You may be lucky enough to see the 'old guys' sitting on the park benches in 'The Diamond', no doubt chatting about 'The Good Old Days'. The narrow central road through the village is aptly named "Main Street", it is lined with historic listed houses and shops. 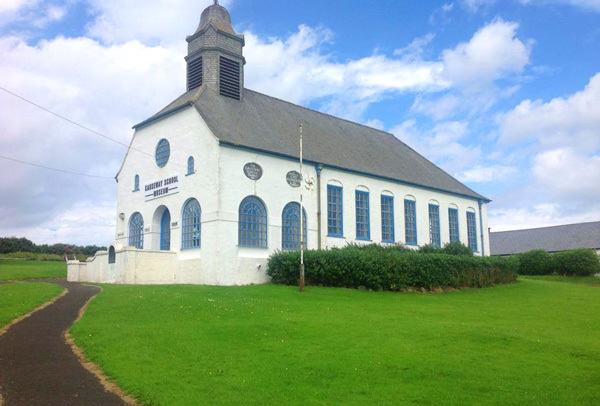 Bushmills has the highest number of Listed Buildings for any town or village in the North East Area. Main Street leads to the Town war memorial in the heart of the village, named 'The Diamond'. In the 1820's the MacNaghten family of 'Bushmills House' were responsible for re-inventing Bushmills as a market village, first established in 1828 with the formation of Market Square itself around 1840. The market town attracted attention as people frequented it more. It had seven active water-powered mills along the river and the region and specifically The Giant's Causeway was becoming a very popular tourist destination. In 1788 Bushmills had five licensed distilleries. Today the Old Bushmills Distillery is a major tourist attraction. You can visit the distillery, taking various tours to experience how the world's most famous whiskey is made! The current building is from the Victorian era, built in the late 1800's. It's worth reading the full history on their website. The eminent Distillery also stages the newly popular festival 'Bushmills Live', a 'festival of handcrafted whiskey and music'. This vibrant music event began in 2012 and now reliably draws crowds to Bushmills each year in June. This Journey is a great experience for people for all ages and a real treat for train enthusiasts! It is, where possible, our preferred way to arrive for a visit to the Giant's Causeway! The start of the line is the railway station just outside Bushmills Town on Ballaghmore Road to Portballintrae.